During the past few years,Rainier Brewinghas partnered a few of Washington’s finest craft breweries. Two years ago, it was with Reuben’s Brews and last year was with Georgetown Brewing. Now the iconic Pacific Northwest associated brewery teams up withAslan BrewingonKing of the Mountain Pilsnerthat benefitsProtect Our Winters. The release for the new King of the Mountain Pilsner will take place this coming weekend duringMt. Baker Legendary Banked Slalom, now in its 33rd year held at Mt. Baker. The world-renowned LBS is the oldest single-venue snowboard competition in the world, bringing together hundreds of the world’s top riders each year from all generations to compete head to head and reunite with the rest of the snowboard community. On February 8th,King of the Mountainwill be released to coincide with the opening day of Mt. Baker Ski Area’s Legendary Banked Slalom, taking place from February 8-10. The name of the beer is a playful nod to the event itself as well as to the two partnering breweries. 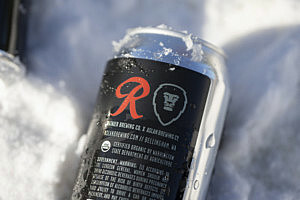 The Aslan logo is a lion (the king of the jungle), and Rainier Beer is named after the mountain. Plus the two breweries produced some fun videos that are reminiscent of the legendary Rainier Beer commercials from many years past. The collaboration brew will be available throughout the weekend on Mt. Baker, at participating area bars, and at both Aslan locations in Bellingham (until supplies last). Five percent of the beer’s total sales will go to supportProtect Our Winters(POW), an organization of winter athletes and forward-thinking business leaders working toward systemic political solutions to climate change. The weekend-long celebration will culminate in a co-sponsored Wrap Party at Graham’s Restaurant in Glacier, WA on Sunday February 10th from 6:00pm until late. The party is open to the public with live music and lots of Rainier and Aslan beer, including a chance to tryKing of the Mountain.